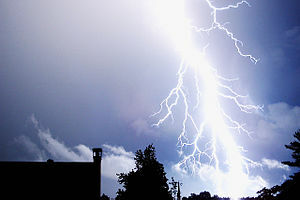 Every day, we do the spiritual equivalent of running through lightning. We ‘duck’ from God as we do things that separate us from him and others, as though the sins we commit could somehow be hidden from him if we only make ourselves very small. We convince ourselves that these things we do aren’t really that bad, that no one knows what we’re doing or worse, that no one gets hurt. But, anytime we behave in ways that are contrary to Christ’s teachings, we are harming someone, often ourselves or the ones we love most. The impulse to duck, though, might just be the key to stopping those behaviors. Just as we instinctively duck the lightning, knowing how much it could harm us, if we listen to our ‘duck impulse’ spiritually, we know exactly when we’ve taken a wrong turn. A course correction in the moment we feel that impulse makes all the difference. As Jesus told us in John 14:26, “But the Advocate, the Holy Spirit, whom the Father will send in my name, will teach you everything, and remind you of all that I have said to you.” Sometimes those reminders come as impulses to duck! This entry was posted in Life and Faith and tagged Christ, Duck, Holy Spirit, Lightning, Sin, Spiritual life. Bookmark the permalink.